Cat is called "Neko" in Japanese. Even though black cat is considered a symbol of ill omen in the West, it symbolizes good luck and prosperous business in Japan. 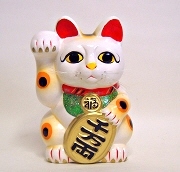 And a Makekineko, decorative figure of a seated cat, with one of its front paws raised to invite people in, is considered to invite fortune into their homes.